This is moon phase patina with inlaid precious metals for the astronomical indications. The sun at 12 o’clock is solid, hammered 24K yellow gold. The full moon at 10 o’clock is solid, hammered platinum pt950, like on moon phase brass. The new moon at 4 o’clock is solid, hammered, dark-patinated sterling silver 925. 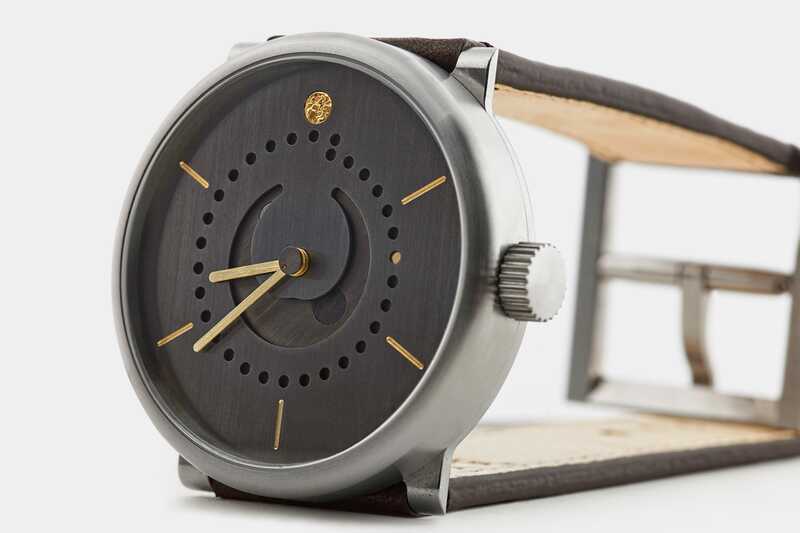 The metal work is performed by hand by Marc Höllmüller in Lucerne, who also makes the copper-patinated nebra dial for us. The watch pictured above is in a 42mm titanium case. You can also have yours in a 39mm or silver case.